An awesome article from two of my favorite statisticians on scientific overreach, power poses, and why we really need to stop quoting studies that don’t subsequently replicate. The day this went up I Tweeted it out, and within an hour someone I follow posted an article they had written that day quoting the original study. Didn’t correct it when I sent them the link either. Harumph. I have ongoing debates with quite a few friends over appropriate emoji use. This paper should help us out. A Crusade Against Multiple Regression Analysis. I’m in. Any crusade that has an upfront statistical warning label as end goal is one I can get behind. What social science reporting gets wrong, according to social scientists. I saw this one then 3 people sent it to me, which makes me feel like I’m headed in the right direction in life. How you are going to die and at what your chances are of being dead at given ages. Given that I’ve already lived as long as I have, my chances don’t hit 50/50 until I’m 81. I’ve been playing Guess the Correlation. Current high score is 88. Totally not in my normal wheelhouse for research I look at, but the Assistant Village Idiot’s take on a study about the origins of fairy tales was fascinating. This take on the recent debates around nutrition science is a long-ish but fascinating read. Good to see all sides represented at once. After my post of my own new years resolution reading, I thought it might be interesting to follow up with a couple of new books I got my son for Christmas. He’s 3 and has officially moved from merely being able to recite numbers to actually being able to count objects. While obviously he’s a bit young for statistics, I want to get him introduced to the world of math and some of the people who inhabit it early. Relatedly, here’s a nifty math skills/developmental chart I found for early childhood. This one we started using immediately, and it’s quite fun. Basically this is a four book series, created by a mom who realized that while kids get introduced to reading in a fun environment (home, in a parents lap before bed) they get introduced to math in a much less fun setting (later in a classroom). She decided to fix that by putting out books of funny math problems kids could do at home before bed. It has problems for several age groups, starting at around 3. Very fun, and a nice balance for traditional bed time routines. This one is a big favorite, though we don’t make it quite to 100 yet. Curious George is my son’s hero right now, so I figured I’d use it to encourage him to go further in his counting. I’ve mentioned my own obsession with Paul Erdos, and I’m trying to pass it on. Erdos apparently would call children “epsilons”, but Finn doesn’t seem to be taking to that name. This one’s a little long for a 3 year old, but it’s interesting and the illustrations are amazing. This one was recommended to me by my favorite children’s librarian (hi Tracy!). It’s about Fibonacci and is another one that’s slightly too long for a 3 year old, but interesting and historically enlightening. Mathematicians tend to be really fascinating people. Man, it’s 2016. Where does the time go? As we head in to 12 fresh and beautiful new months, I thought I’d take a moment to share the stats/math/science books I plan on reading in the coming year1. Some of these are books I’ve bought and been letting sit, and some are books I plan to get in the near future with the awesome Amazon gift cards I got for Christmas. If I get really ambitious, I may even put up book reviews of some of these when I’m done. I’ve also been toying with doing some sort of master stats/critical thinking book list like the Personal MBA2 list, so please add any suggestions. I’m taking a Epidemiology stats class in January, and this book has been highly recommended by my science teacher brother as a compelling story of how the field got started. How better to recognize Valentine’s Day than to read a book about a man who loved nothing but numbers? I’ve been a little obsessed with Erdos for a while now (I even got my three year old this book for Christmas), but I haven’t yet read this one. I’ve had this one half finished on my bookshelf for so long they came out with a second edition. I’ll probably just finish the one I have. Another one that’s been sitting on my shelf for a while….and what better month to read about stats and baseball? I’m always looking for new ways of explaining stats, and there’s some very cool narrative textbooks out there I’ve got my eye on to improve my repertoire. This is one of them. Another one I’ve half finished, but June seems like a good time to read a book about beautiful things. A Christmas gift from a few years back I’ve severely neglected, but need to read before we actually get to the next election. I’ve admired Gelman’s work for a while (he has a great website here), and I’d be interested to see how he approaches teaching statistics to students. I started this one, but I put this one down because of a busy semester, so I’ll try to get it in right at the beginning. It gives the history of some of the world’s most interesting and useful equations, their development, and how they’ve influenced the world. An interesting historical take on mathematical development. Just in time for Halloween, something scary. Another interesting looking narrative about math book. Looks like a fun read for the end of a semester. If your curious about the making of this, here’s the blog. Little known fact: I once spent a summer watching every James Bond movie ever made, in order. 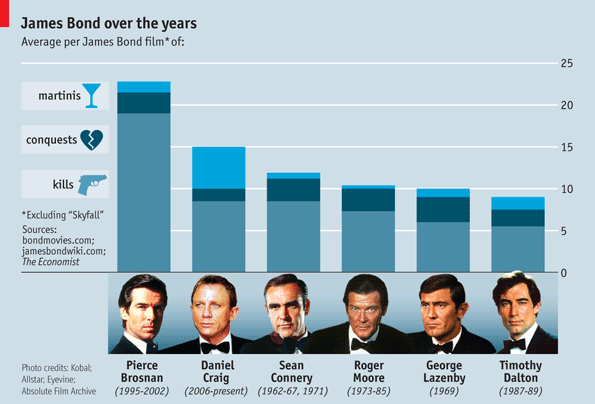 Thus, I enjoyed this chart from the Economist about the differences between the Bonds. By themselves they’re fairly fluff, watching them in order shows some interesting things about societal trends. Everything from the theme song, special effects and villians to the choice of Bond girl to the demeanor of Bond himself shows a lot about what the particular era valued. I’m sure there’s been a PhD thesis written on this somewhere, it’s really quite fascinating. Sean Connery was my favorite Bond, though I did like On Her Majesties Secret Service more than most. Daniel Craig updated the series nicely for my generation, making it quite a bit darker than previous years. Posting’s been a bit slow this week, as I’ve been ridiculously distracted by an upcoming conference this weekend. On the plus side, if anyone cares to hear my thoughts on inter-professional differences in communication and conflict, I’ll be speaking on it Sunday morning at 8:30am at the AABB meeting at the Boston Convention Center. Normally my public speaking style is fairly laid back and has some improvising….but as I haven’t been able to string too many coherent sentences together for the past few weeks post-baby, I’m a little nervous about this talk. Thus blogging time has turned in to “practice your talk” time. I’m hoping that winds up being a good trade. Any prayers/good vibes/happy thoughts would be appreciated. Also, you’d like my talk. I use the sentence “so this is a little kumbaya, why should care in the real world?”. I think that sentence should be used in all talks about how to get along in the workplace. I also raise the idea that diversity of thought is an incredibly under recognized aspect of diversity, and that’s not a good thing. I think that idea should come up in every talk where the word “diversity” is mentioned. I have a love hate relationship with graphs like these (from the National Journal). On the hate side – implications of correlation and causation, using random variables to grab headlines. On the love side – oh! colors! bubbles! Fun!!!!! The data for this one actually looks pretty good….survey results for over 200,000 people….and the survey was done by a polling group and not, say a beer manufacturer. A pretty good breakdown of some of the data is here. They point out some funny things, like the proximity of Romney campaign headquarters to the Sam Adams brewery, and that the most likely Dems to turn out actually drink a Canadian beer (Molson). Shiner Bock makes sense to me as I’ve only seen it sold in Texas and parts thereabout, and Corona always makes me think of the spring break crowd. I’m a hard cider girl myself, though that’s due to an allergy. I guess it is true that I skew Democrat, but mostly because in Massachusetts all your local races are pretty much uncontested Dems….so I probably have voted for vastly more Dems than Repubs in my life. I’d like to see a bit of a note on how the size of the circle relates to absolute number of people (is that Lone Star drinker in the corner just one guy or 10?) but overall, this is fun. It will definitely compliment the debate drinking game well. Stay thirsty my friends.